By default Zentimo stores settings on external drive. E.g. whenever you change the device name, image or add app to quick launch list all this information is stored into ZentimoSettings.ini file in the root folder of the external drive. This allows settings to be portable: you will see the same name, same portable apps list and the same icon when you attach your pen drive to another computer where Zentimo is installed. 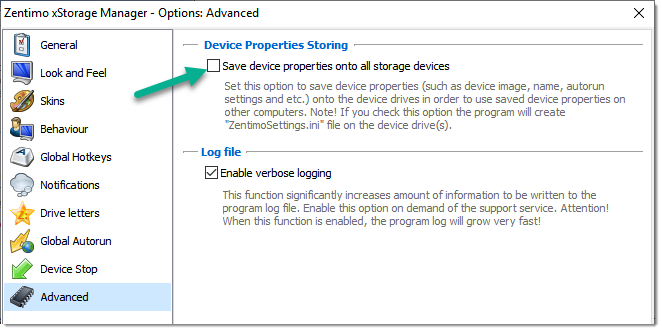 If you do not wish that Zentimo stores anything to your removable drives you can disable this feature for all devices and enable for some selected devices. In order to disable this option for all drives just go to the program settings, switch to the "Advanced" tab and uncheck "Save device properties onto all storage devices" option. If you wish to enable this option for some selected devices you should first disable it for all devices (see the paragraph above) and then go to the device options (click Menu button on the device in the menu), switch to the "Device Management" tab and enable the option "Save device properties onto this storage device".